BPT is one of the world’s foremost developers and manufacturers of a wide range of armour protection materials and products used to protect personnel, vehicles, ships, aircrafts and buildings against bullet, shrapnel, Improvised Explosive Device (IED), Explosively Formed Projectile (EFP), landmine and High Explosive Anti-Tank (HEAT) threats. The company is also one of the world’s largest manufacturers of body armour plates for bullet proof vests (not supervests). BPT offers high-tech expertise and skills over a wide range of products and systems in the lightweight bullet resistant and armour protection fields. 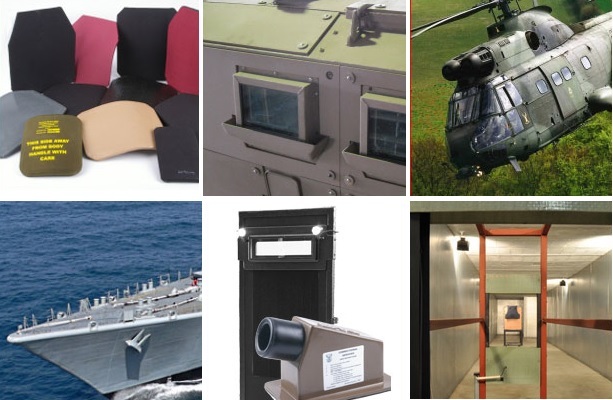 These products include: Body Armour, Vehicle Armour, Aircraft Armour and Ship Armour and other products such as Ballistic Shields and Bullet Traps.In house manufacturing of most systems allows BPT to provide quick turnaround supply of most products. Established in South Africa during the last phases of the border wars, BPT has extensive experience of actual attack situations and the threats encountered. Since then BPT has supplied a large quantity of body armour plates (increased protection for bullet resistant vests), vehicle armour kits and aircraft armour for use in the Iraq/Afghanistan war theatre. Materials used include Ceramic, “Kevlar”, “Twaron”, HPPE, high strength fibreglass, polymers, special metals, high rigidity/low weight laminates and composites combining the advantage of each material in the correct ratio. To ensure consistent quality, manufacturing processes include “Hot pressing”, vacuum bonding, “Auto claving”, hand laminating and special cutting processes such as water-jet cutting. BPT has the knowledge and equipment to perform scientific ballistic testing which conforms to most standards. These tests include testing which is based on the NIJ test procedure using controlled plasticine as the backing. All testing up to 7.62mm calibre is performed in BPT’s own in-house testing range. Testing against larger calibre and other explosive threats is performed in collaboration with partners such as Armscor Defence Institute at various facilities. CBC - Companhia Brasileira de Cartuchos S.A.